Oakland Mayor Libby Schaaf joined AT&T, Peralta Colleges and other community organizations at City Hall on Wednesday, Sept. 7, 2016, to kick off “September Giving,” a four week campaign during the month of September providing more than $400,000 to Oakland nonprofit organizations that are empowering students this “back-to-school” season. Mayor Schaaf and AT&T presented the first of four awardees, Peralta Colleges Foundation, with a $35,000 contribution to support Oakland students as part of the City of Oakland and Oakland Unified School District’s Oakland Promise initiative. AT&T will make three additional contributions every week of September to The Hidden Genius Project, Art Works for Change and Black Girls Code. Each week, AT&T will highlight a “September Giving” awardee and their efforts empowering students on Twitter using the hashtag #SeptGivingOAK. Organizations and programs benefiting from “September Giving, ” the first of which included the Peralta Colleges Foundation gift of $35,000. 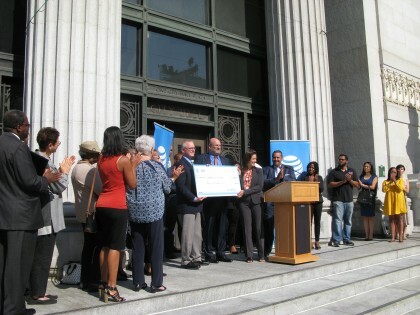 Kevin Kosik, Executive Director of the Peralta Colleges Foundation, pictured, accepted the check from AT&T. The mission of the Peralta Colleges Foundation is to enhance the intellectual, cultural and educational needs of Peralta students, faculty and staff and the communities in which they work. AT&T’s contribution supports low-income first-semester students at the Peralta Colleges – from high schools in the Oakland Unified School District – by providing student awards to cover the cost of Enrollment Fees, Health Fees, Use Fees and Transit Fees as part of The Oakland Promise initiative.